My unofficial Starquake sequel (and first Keen mod) is ready for release - BIG thanks to all those who supported the project in one way or another, I couldn't have done it without this community. * Glorious, eye-hurting pseudo-CGA graphics! * First-ever flying enemy in a Keen1-mod thanks to KeenRush! * Story elements all over the place! Please let me know of any bugs you find, thanks. excelente con matrícula de honor! 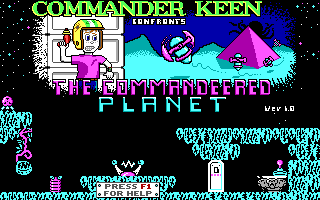 Commander Keen, The Fighting Machine strikes back. congratulations! judging by the list of features your first Keen mod already stands out and sounds delicious! I can't wait to test this dope looking Cybernoid mod. The levels are extremely well structured so far with just the right level of difficulty and flow with new surprises added gradually. Up to the white city to the north and things are starting to get interesting. I've heard of Starquake but never played it. I'll keep it in mind when I tackle some Spectrum gaming in the future. Wow. I'm surprised how much the world map has changed since the beta testing. Really neat work. Overall now it feels like a complete mod. And the difficulty is better (even too easy I might add, but that's maybe because as a beta tester I'm very familiar with the levels). I don't know what more to say. It's just an excellent keen 1 mod with more stuff to explore and figure out than your typical keen 1 mod you can find on shikadi wiki. Probably it will be the best one of this year. 10/10. I would like to see if other players will make a playthough of it. Would be fun to watch. Thanks for all the kind words. If this mod can bring back good memories of computer games from long ago, then I consider it a success. Wow. Just played the whole thing straight through! Amazing work, especially for a first mod. I'm impressed by how distinct each level is (great level design, by the way), and that achieved with a relatively small tileset. The decision to use CGA-like graphics was an interesting one and paid off. Interesting tiles. I love the four frame tile enemies. Also impressed that Lass managed to make that periodic hazard tile -- have to try to find out how it was done. It's also interesting how well my flying enemy works in these environments: I totally didn't expect this! It seems almost intelligent. Also, loving the Alley cat references. One of the first games I played. Hoping there will be more mods in the future. Glad you liked the mod, KeenRush. I'm also very satisfied with how your flying enemy ended up, it's behaves very much like it's Starquake-inspiration - awesome patching you did there! Did anyone find the secret level? I'm wondering if it is too hard to find. Perhaps I should leave a hint somewhere in one of the levels...? I'm still struggling with the patch file to make this mod run on my handheld. so it might take some time before I get the chance to search for the secret. but I'm very curious. Didn't find the secret level but I'll keep my eye on it during the next time I play. Also one thing I forgot to mention: loved the idea of the collectiables being dangerous waste and by collecting them one is cleaning up the planet / making it environmentally safer. Keep forgetting to download and play it. Is it Vorticons or Galaxy mod? I'm only a few levels in so far (I'm not nearly as good at vorticons gameplay as I am galaxy ) but I can already tell its a good mod. Good difficulty curve, new enemies and hazards are introduced gradually as you progress through the levels. I have never played starquake, so I don't recognize anything, but I think all the graphics look nice and crisp. 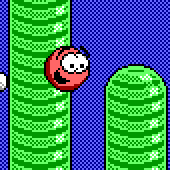 Using only the CGA colours, I think it could have been easy for the levels to look bland, or be hard to tell what you can stand on and what kills you, but I haven't had any issues so far telling where you can stand and what things are hazards. Also on the topic of aesthetics and level design, I like how there are paths here and there that don't really go anywhere but make it feel more open realistic (but they're also not just long annoying dead end hallways). On the main map in particular I notice this. In the levels, sometimes areas are connected with a 1 tile high opening so Keen can't get through but the Yorp replacements can, so different areas are segmented but not totally closed off from one another. I like this sort of level design. I find ammo a touch scarce, but I don't really see this as a negative, I like having to watch your ammo a bit. Its been just the right amount for me so far. Also, I enjoyed the oracle member banter in the opening story. I managed to play this all the way through (including the secret level, I just felt like there was something with that one wall) and created a KeenWiki article for it (which is mostly complete, just needs the story, tile hazards, and values for the levels, such as points and ammo), and while I've never played Starquake (although I did look it up out of curiosity), I must say this is really well-made! The levels are really good, and I like how there is quite a number of secrets to find. I also liked some of the cute art you made out of tiles (such as that Garg lookalike in level 7 and the arcade characters in the big pyramid), and how you did the part with the chain and block (seriously, that was just clever)! The layouts felt like they were naturally made, with the 1-tile passages and paths that don't really lead to anywhere. The difficultly felt just right to me. For patches, I find the Garg replacement's behavior and periodic hazard to be interesting and well-utilized. The graphics look really nice, I thought the decision to make them pseudo-CGA made them look unique and even cool. I agree with what KeenRush said about how did the points and 4-frame tile hazards. Overall, this is a really good mod! I recommend this to anyone who hasn't played it yet, and I'm looking forward to anymore you might do in the future!